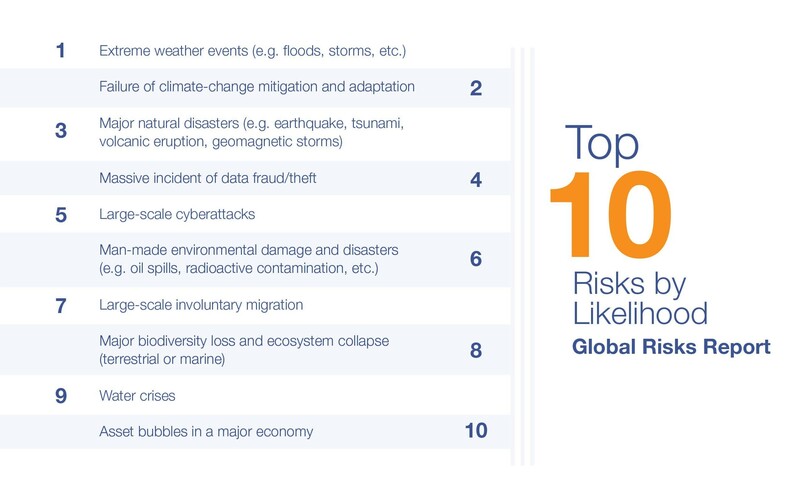 For leaders surveyed for the latest edition of the World Economic Forum’s Global Risks Report, environmental threats dominate the list for the third year in row – both in terms of impact and likelihood. “Of all risks, it is in relation to the environment that the world is most clearly sleepwalking into catastrophe,” the report warns. Our inadequate response to deal with the threats posed by climate change and reduce greenhouse gas emissions – ‘Failure of climate-change mitigation and adaptation’ – is in second place on both lists, reflecting respondents’ increasing concerns about environmental policy failure. A World Wildlife Fund report from last year highlighted the extent of the challenge we face – with loses in vertebrate species averaging 60% between 1970 and 2014. Last year saw numerous data breaches, with millions – if not billions – of people’s data affected, as well as continued cyber-attacks on both public and private institutions and businesses. 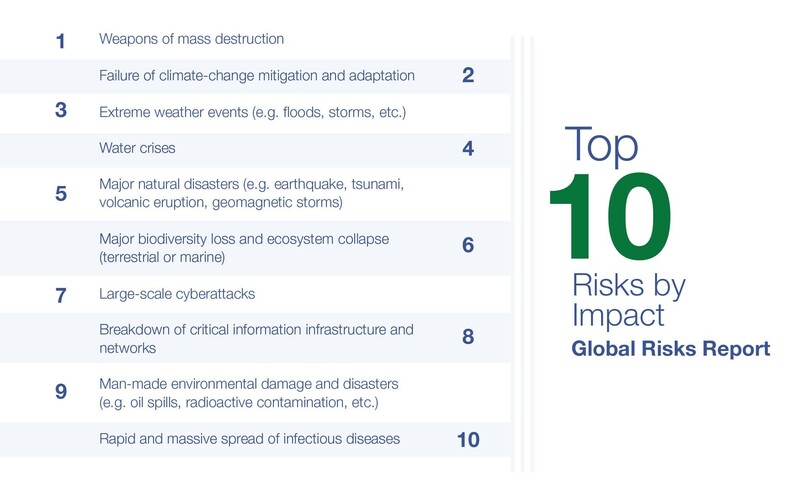 In terms of Societal Risk, water crises, defined as “a significant decline in the available quality and quantity of fresh water, resulting in harmful effects on human health and/or economic activity” are a concern that features on both lists – at number four for impact and nine for likelihood. Financial market volatility and slowing global growth through 2018 are highlighted by the authors – and indeed by the latest International Monetary Fund forecasts. 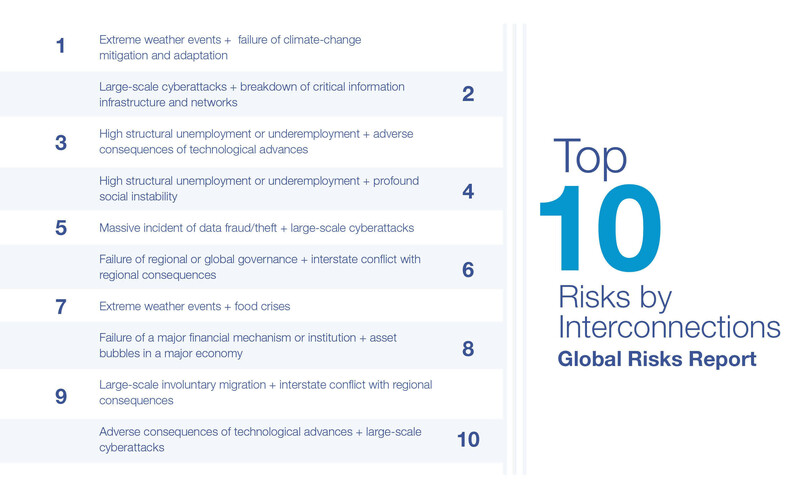 These risks don’t exist in isolation, though. They’re interconnected and each has the potential to affect the others – as the following chart from the report explores.